Morrisville, NC – Anutra Medical is rapidly expanding and has brought on Jeffery Daner as the Vice President of Business Development. The company has secured additional funding to expand its reach into the medical market. Mr. Daner, a veteran in medical industry has had a distinguished, sixteen-year career at Midmark Corp. “For 16, almost 17 years, I learned an unbelievable amount of business from a market leader. It is time for me to take that information I have learned and bring it to a new innovative product making a difference in the medical world,” Mr. Daner said. “For almost two years I have been watching Anutra grow from a distance. When the opportunity presented itself, I knew it was the right fit.” “As the company continues to grow and expand its reach beyond dental into medical, we are excited to bring on an enthusiastic and accomplished VP to lead our company forward into the medical markets,” CEO Cameron Perkins explained. “I came to Anutra because, based on my experience and what’s going on in healthcare, the company correctly answers three key questions for the market: ‘Does the product enhance patient experience? Does the product provide value to workflow? Does the value justify the cost?’ and Anutra answers all three questions,” Daner remarks. With continual changes in the healthcare industry, patient comfort and a streamlined workflow are increasingly in the spotlight. 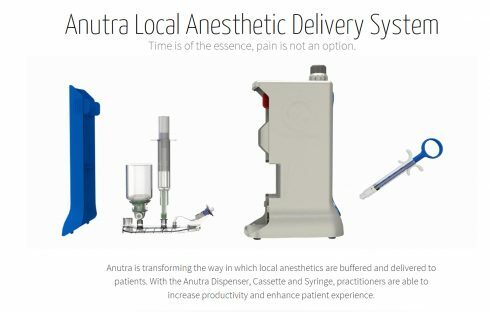 The Anutra Local Anesthetic Delivery System® is a closed-mixing device that precisely buffers local anesthetic. Buffered anesthetic increases patient comfort when receiving a local anesthetic injection and rapidly speeds up the onset of anesthetic. The fast-acting, virtually pain-free injection streamlines the workflow in an office in boost patient satisfaction. “Our product is a game changer when it comes to both patient satisfaction and office workflow,” Director of Marketing, Ryan Vet shares. “With Jeff’s excitement, creativity and drive, he will help our team continue our success as we move into the medical market. Jeff will work with healthcare providers and executives to help them implement Anutra into their practices ultimately revolutionizing patient satisfaction and practitioner efficiency across the industry.” Anutra Medical plans to start selling into the medical market later this year.